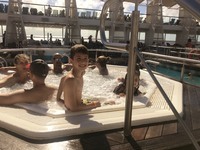 My daughter, son-in-law and two grandchildren took me on this marvelous cruise! 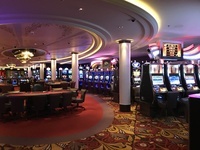 From the moment I stepped onto the ship, the experience of a life-time began! The ship was spectacular in every way! The cruise director (Eddy) was always entertaining the passengers with wonderful shows in the &apos;Reflections Theater&apos;, Trivia Quizzes throughout the voyage, the Ocean View Cafe was amazing, with delicious choices of food, not only American, but from other countries as well! It was a wonderful Buffet experience for breakfast, lunch, dinner, as well as snacking throughout the day! The Opus Dining Room was a lovely experience with a courteous staff and not only delicious food, but the presentation of the food was done eloquently! In fact, the entire staff aboard this ship went above and beyond to make sure each and every guest was completely satisfied! The activities were plentiful and the &apos;Fun Factory&apos; and Kids (Camp at Sea) kept my grand kids occupied and having a blast, as well as safe when not accompanied by their parents and yours truly (Grandma). The Lawn Club Grill featured a &apos;cook-out&apos; experience with many BBQ favorites, delicious as well. The kids got a &apos;hands-on&apos; lesson on Pizza Making. The Coffee Bar offered, not only the best coffee/tea drinks, but pastries that were beautifully created and so delicious as well! 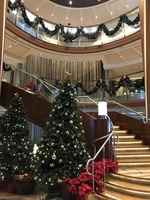 There were displays of Art, beautiful decks and pools, gift shops, activities, jogging track on the 15th deck, a library, &apos;hideaway&apos; places for privacy and many more features, And, I had the pleasure of watching the Cruise Chefs put together the most amazing Christmas display I have ever seen! I really had a hard time disembarking! I WILL BE BACK!!! 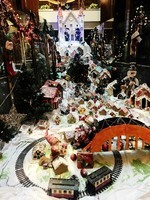 Taken from the Lobby of the ship, part of the Holiday display! 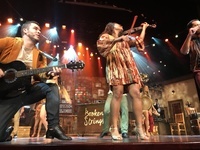 The Reflections Theater Production of 'Broken Strings'! 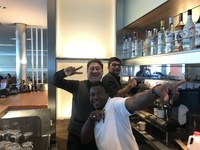 Friendly Staff welcoming me with a special drink! 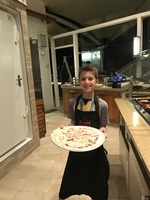 Pizza Making at The Lawn Club Grill! Guests having fun at one of the pools! 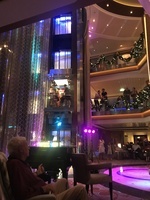 My daughter, son-in-law and two grandchildren took me on this marvelous cruise! From the moment I stepped onto the ship, the experience of a life-time began! The ship was spectacular in every way! 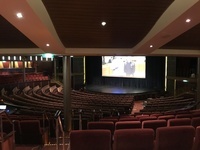 The cruise director (Eddy) was always entertaining the passengers with wonderful shows in the &apos;Reflections Theater&apos;, Trivia Quizzes throughout the voyage, the Ocean View Cafe was amazing, with delicious choices of food, not only American, but from other countries as well! It was a wonderful Buffet experience for breakfast, lunch, dinner, as well as snacking throughout the day! The Opus Dining Room was a lovely experience with a courteous staff and not only delicious food, but the presentation of the food was done eloquently! In fact, the entire staff aboard this ship went above and beyond to make sure each and every guest was completely satisfied! 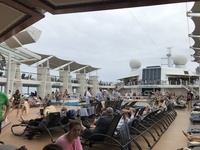 The activities were plentiful and the &apos;Fun Factory&apos; and Kids (Camp at Sea) kept my grand kids occupied and having a blast, as well as safe when not accompanied by their parents and yours truly (Grandma). The Lawn Club Grill featured a &apos;cook-out&apos; experience with many BBQ favorites, delicious as well. The kids got a &apos;hands-on&apos; lesson on Pizza Making. The Coffee Bar offered, not only the best coffee/tea drinks, but pastries that were beautifully created and so delicious as well! 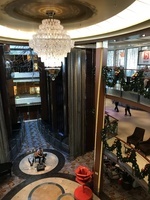 There were displays of Art, beautiful decks and pools, gift shops, activities, jogging track on the 15th deck, a library, &apos;hideaway&apos; places for privacy and many more features, And, I had the pleasure of watching the Cruise Chefs put together the most amazing Christmas display I have ever seen! I really had a hard time disembarking! Our cabin was practically perfect in every way! It was roomy, had bunk beds for the grand kids, nice sized couples bedroom and a sofa that as a bed gave me the best night&apos;s sleep ever! And lots and lots of drawers and closet space for everyone&apos;s belongings! The only thing that could have been just a tad bit better would have been a second bathroom. My daughter, son-in-law and two grandchildren took me on this marvelous cruise! So having an extra bathroom would have gotten us to dinners and some activities a little quicker. Also, with today&apos;s technology, there was only one place to plug-in, (plus an outlet in the one bathroom which was above the sink (for hair dryers, razors). We all had to take turns throughout the day making sure all our &apos;standard&apos; equipment was loaded!